It’s that time of year to bask in all things sparkly, twinkly and bubbly! All three can be found in abundance this holiday season at the Arts Center of Coastal Carolina, when 42nd Street, one of the most beloved shows of all time, bursts onto the stage. This dazzling production proves that you don’t need tinsel, carols and faux snow to completely delight an audience during the holiday season. On stage from December 4-29, 42nd Street extravaganza is full of life, color and energy, making it a truly wonderful production for all ages, and is in fact, a perfect event to share as a family. Like the 1933 Busby Berkeley film from which the stage musical was adapted by Michael Stewart and Mark Bramble, 42nd Street is set against the Depression, and was the ideally-timed escapist fare for this era. And there’s nothing depressing about this non-stop fun show at the Arts Center either. From the opening curtain ascending two feet to reveal only a line of time-stepping feet, through the rainbow-hued “Dames” and gilt-edged “We’re in the Money,” to the tap ballet, you’ll be swept up in the inspirational, beat-the-odds, showbiz story that is a perfect dose of optimism for the holiday season. Returning from New York City once again, is one of the Arts Center’s most beloved directors, Casey Colgan, casting his unique kind of stage magic once again, while creating a wonderful tribute to the exhilarating excitement of the grand Broadway musicals. It’s also a celebration of some exceptional artistic talent. This is a story of hard work, being in the right place at the right time, talent and love. It’s the timeless “backstage” fable, tracing a Broadway musical-comedy from casting call to opening night. The show-within-the-show’s director Julian Marsh (Jeffrey Watkins) loses Dorothy Brock (Susan Powell), the headliner of his Broadway-bound show Pretty Lady, to an onstage mishap, allowing for the game but unproven, apple-cheeked Peggy Sawyer (Gabrielle Ruiz) to step into the spotlight and begin her own rise to showbiz stardom. Peggy has exactly 36 hours to learn 25 pages, 6 songs and 10 dance numbers. As Julian says, by the next evening, he’ll have either a live leading lady or a dead chorus girl! A hint of romance is in the air between the confident but infinitely likable lead Billy Lawlor (Nic Thompson) who sings, dances and charms his way into and Peggy’s heart—and ours—with his “Young and Healthy” (with Ruiz) to heading up the snappy, sensational “Dames” production number. Throughout the show, you’ll be doing all you can not to sing along (or even dance along) to the beloved classics such as “We’re in the Money,” “Lullaby of Broadway,” “Shuffle on Down to Buffalo,” and, of course title song “42nd Street,” in this quintessential tap-dancing show with one glittering production number after the other. There’s no doubt that this tap-happy musical features a dazzling rat-a-tat tap style that is irresistible. Close your eyes during one of the crescendo chorus-line numbers and you will hear the clicking synchronization of countless dancing feet. It’s a credit to choreographer Kelli Barclay and the show’s energetic hoofers that the riveting tap is so precision-perfect. Barclay comes to the Arts Center from New York City, who in addition to dancing on Broadway herself, worked alongside Randy Skinner on many Broadway musicals including Ain’t Broadway Grand, Irving Berlin’s White Christmas, and the revival of 42nd Street, all earning Tony nominations for Best Choreography. The set and lighting design are both rendered in an art deco style by Terry Cermak, vice president of production. Adding the Colgan-signature sparkle and shine, Diana Griffin created the costume design for the show, using period designs that replicate the era of the early ’30s. Music direction is by the talented Bradley Vieth, back to the Arts Center for his seventh show, most recently having musically directed last summer’s Chicago. 42nd Street was a surprise smash when it originally opened on Broadway in August 1980, directed and choreographed by Gower Champion, who died hours before the opening curtain. Drawn from the film of the same name, and fueled by a score culled from various Warner Bros. movie musicals, this is one of the longest running musicals in Broadway history. Winner of the 2001 Tony award for Best Revival of a Musical and the Drama Desk award for the same category, 42nd Street makes us all believe that dreams can come true! 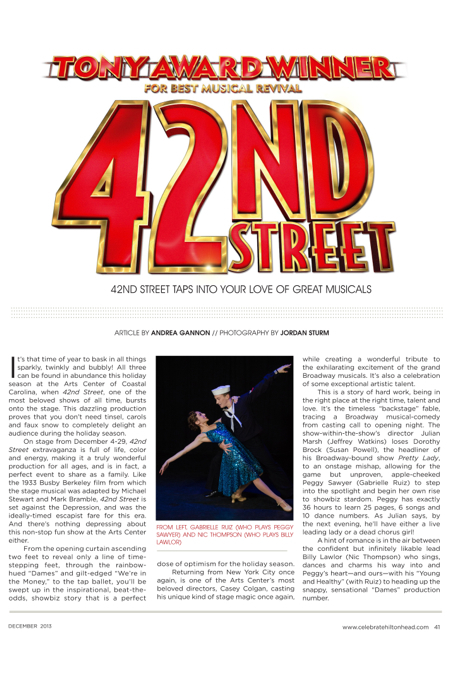 Audiences craving unbridled pizzazz and a respite from holiday chaos should race to get their tickets to 42nd Street, which runs from December 4-29 at the Arts Center. Tickets are $45/adult and $31/child for previews on December 4 and 5 and $55/adult and $37/child through December 29 and may be purchased online at artshhi.com or through the Arts Center Box Office at (843) 842-ARTS (2787).